Mediaeval and Renaissance homes and palaces were cold. There was no insulation, in earlier times no windows, and, of course, no artificial heating. The only source of indoor heat was a fire, or a brazier (a stove, with a fire inside). To block draughts, if you could afford it, fabric was hung over the walls, stretched taut on a frame or tenter, using ‘tenterhooks’. 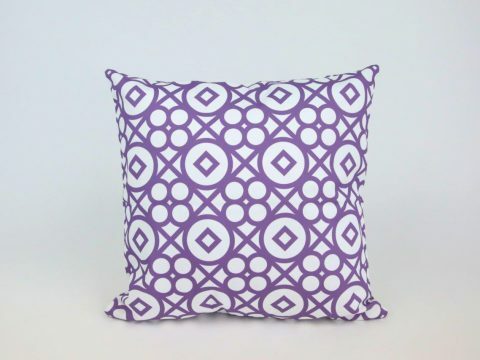 In houses of middling income, the fabric was usually painted cloth. As you went higher up the scale and could afford more, you might be able to buy a small piece of a tapestry. If you were enormously wealthy, you might have several tapestries – a group was known as a chamber, or a suite. 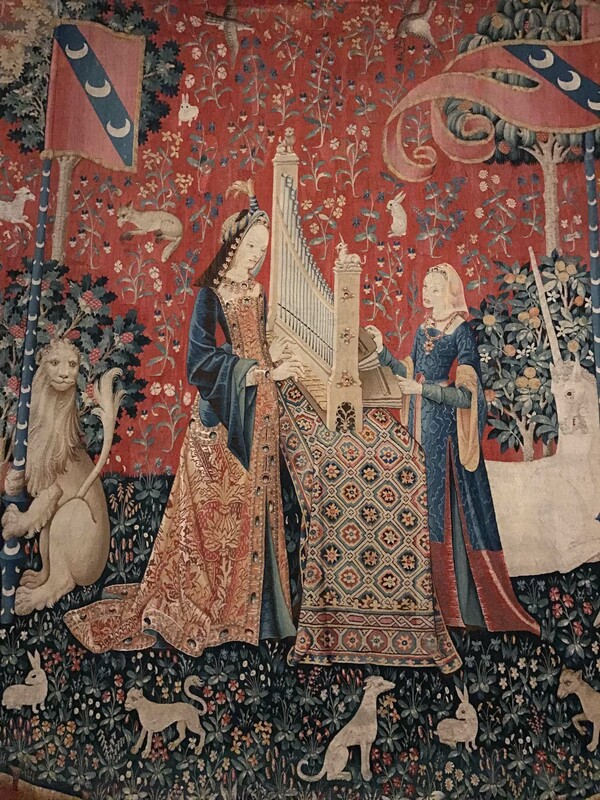 One of the best-known, and best-loved, series of tapestries, is that of the Lady and the Unicorn. No-one is sure who commissioned them, but the arms of the Le Viste family, which adorn the various scenes, narrow it down to that family. Antoine Le Viste, (c. 1470 – 1534) is considered the most likely commissioner, perhaps for his marriage to his first wife, Jacqueline Roguier. Le Viste was a member of the Parliament of Paris, as well as having a position in the household of Louis XII. In 1499, he was one of the commissioners sent to Arras to receive the homage of Duke Philip of Burgundy, for the Burgundian lands held from the French crown. The designs for the tapestries were probably were created by the Master of Anne of Brittany’s Très Petit Heures (Very Small Book of Hours), whilst the actual weaving was probably carried out in the southern Netherlands, where the best manufactories were located, possibly in Arras, or perhaps Bruges which had overtaken it as the centre of the weaving trade. The suite consists of five tapestries, representing the senses – sight, taste, hearing, smell, and touch, and a sixth, called ‘Mon Seul Désir’. The background of each, although now faded, was once a rich red, covered in small animals – hares, monkeys, birds etc - and flowers in the style called ‘millefleures’, which was most popular in the period 1480 – 1520. At the centre is a young woman or women, undertaking various activities to represent the senses. It is not clear whether the woman is always the same, although the dresses and hairstyles indicate some repetition. Throughout, there are symbols, recognisable then, but sometimes obscure to modern viewers. The motif of the unicorn is clear – it was believed that such creatures could only be tamed by a virgin, as are the pomegranates in the allegory of taste, symbolising fertility. In the centrepiece, ‘Mon Seul Désir’, the lady is either taking out, or putting away, a quantity of beautiful jewels – this has been read both as symbolising that she is about to marry her lover, or even that she is about to renounce the world for the cloister. The tapestries were rediscovered in the 1841, mouldering in the chateau of Boussac. 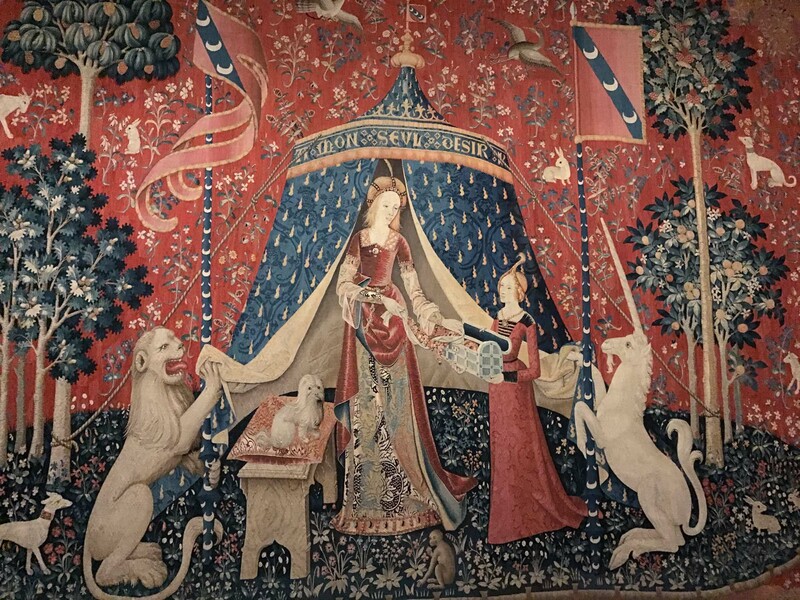 In 1863, they were purchased by the French state for 25,500 francs and transferred to the Musée de Cluny, where they were restored, and have been on display, to delighted crowds, ever since. They are currently on display at the Art Gallery of New South Wales, in Sydney, Australia. Anyone who can visit, is strongly urged to do so – the exhibition is brilliantly mounted. It extends until 24 June 2018.